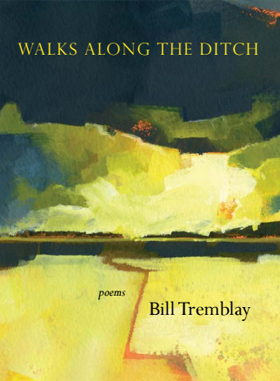 BILL TREMBLAY takes his reader on a memorable peripatetic in Walks Along the Ditch, performing the rare feat of overhearing himself while at the same time engaging his reader with stories that resonate as myths to live and die by. Tremblay’s speaker “contains multitudes” as he walks beside his oracular ditch, finding his “tongue” there. In language that resonates with an evocative clarity reminiscent of James Wright’s intense plainness, Tremblay combines memory with meditation, the present-day with history. “Perhaps/ the Sumerians learned to write from trenching/ ditches in the earth with picks and shovels/ and white lathered horses, the song of it a struck tuning fork in the mind ...” he writes in “The Larimer-Weld Ditch.” Tremblay continues to dig and divine this same ditch in these poems as he ambles beside it so wakefully, inviting his reader to listen. BILL TREMBLAY has gone his own way so long that the latest turn -- a leap, actually -- in his work shouldn’t surprise. Yet it does. After devoting decades to dramatic narrative sequences rooted in North American history, he presents us with Walks Along the Ditch, an inside story of the close-at-hand and close-at-heart. The public vision persists, but now is tightly bound up with the personal: the ache of aging, the interflow of memory and the present moment, abiding bewilderments and bracing clarities. It’s as if he has awakened in a spacious Now where wisdom is free to happen—and so it does, thanks to the poet’s hard-earned mastery.